There are tons of hikes on Oahu. Or maybe you’ll be pushing along a stroller so you are looking for a stroller-friendly hiking trail. Each of them is worth choosing as a hike on Oahu for their own reasons. So, what are some good paved hiking trails on Oahu? 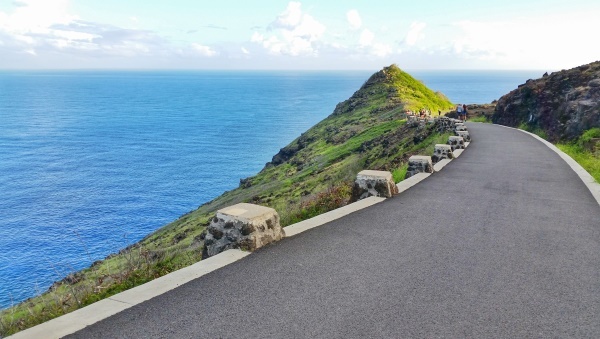 If you’re looking to give yourself a workout while getting stunning coastal views, the Makapuu Lighthouse Trail is a hike worth considering! This out-and-back paved trail on the east side of Oahu is pretty much all uphill to reach the end point of the trail. This incline isn’t too bad, but you may start to feel it eventually. But you can see the ocean pretty much the entire time which means there are plenty of distractions to take your mind off the hard work you’re putting in! 😉 There are also plenty of easy stops you can make along the way. 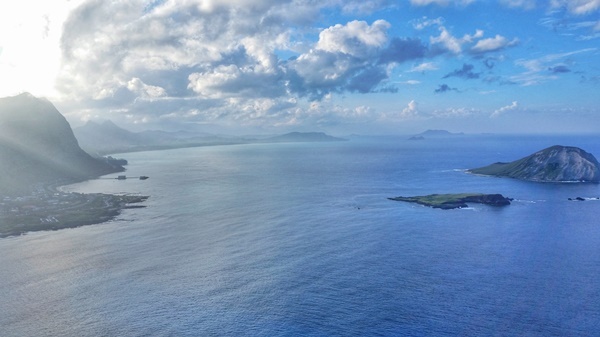 This can be a perfect hiking trail if you’ll be on Oahu during whale season. It’s one of the best spots for a chance at whale sightings on Oahu for free without going on a tour. There are even free binoculars along the trail to help you spot them. But you might want to take your own binoculars anyway! For a paved hiking trail with a waterfall sighting, then the Waimea Falls Trail is a hike worth considering. This is another out-and-back paved trail. These Oahu waterfalls are on the North Shore, so if you’re interested in other things to do on the North Shore, it can be a perfect addition to your itinerary. This hike is located within the Waimea Valley park, for which there is an entrance fee. 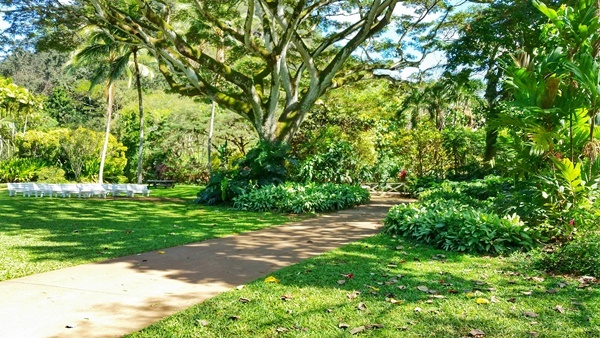 You’ll find more things to do at Waimea Valley, including exploring a vast variety of plants and flowers. If you wander into the areas of the botanical gardens, it won’t always be a paved path. Instead, there’s a bit of gravel footing. 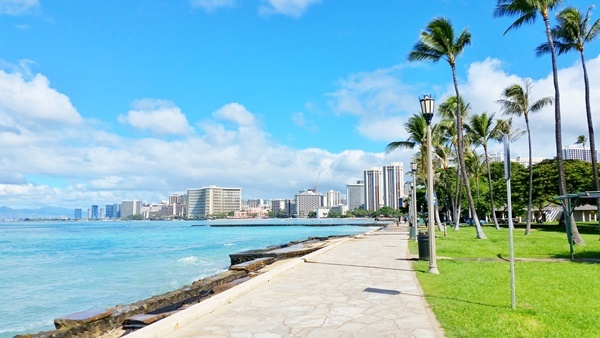 Much of Waikiki Beach is lined with sidewalks, so really you could go for a paved walk in any part of Waikiki. And you really can’t go wrong in going for a coastal walk in any part of Waikiki. But there are 2 areas of Waikiki that you may want to have a look at when you’re looking to get in your morning run or your sunset walk! They are each on the far ends of Waikiki Beach. There’s a boardwalk that starts at the Hilton Hawaiian Village that makes for a nice walk right alongside the beach. This is a popular path for morning exercise for walkers and runners. You may also see some people doing group yoga at the nearby park in the grassy area. There are also lots of family-friendly activities near this beach resort. 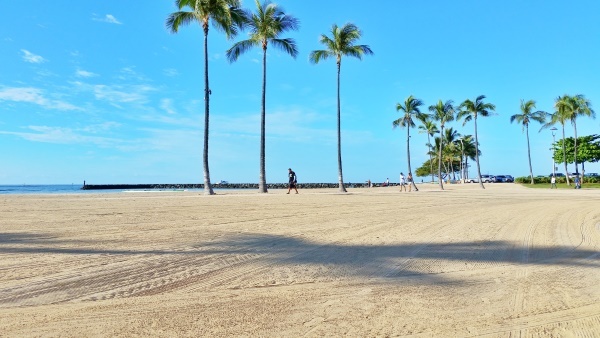 On the other end, right by one of the best spots for snorkeling in Waikiki, you’ll find another walking path that also makes for good walking or running. And you can find many walkers and runners here, particularly at sunset. Since Waikiki Beach is on the sunset side of the island, it can be a perfect setting! This path runs right alongside the ocean in some parts, and then in some parts there’s a beach that separates the ocean and sidewalk. This path isn’t directly next to Kapiolani Park, but the park makes for easy reference on a Waikiki map. Find the park, and then ocean side is the walking path! HAPPY PAVED HIKING IN OAHU! Hit search at the top for any of these items to get more variety on Amazon through these affiliate links! - Walking: These types of hiking sandals. For walking in hot weather, they are more breathable than shoes, while still giving you necessary traction on the trails. Also see these travel sandals. - Beach: These types of beach shoes. For beach walking, wading in the water, and rocky shorelines, they can prevent cuts from hidden rocks or when bumping into coral reef. - First-time snorkelers love full-face snorkeling masks. - These UV protection shirts are a hit so you don't have to keep re-applying sunscreen and don't have to worry as much about getting sunburn! - These types of small backpacks are perfect for a day out so you can carry essentials... and snacks! - And these popular packing cubes can be a life-saver when you're traveling! - On city excursions: This neck pouch that tons of people love. It makes it harder for money to be stolen, and RFID-blocking feature stops thieves from scanning your credit card info when they are close to you. - At the beach: This type of pouch that you can easily take your wallet in the water with you, instead of leaving on the beach. There are affiliate links on this website. This means that if you make a purchase, I may get a commission at no extra cost to you. PedalGoa.com is an Amazon Associate.